1971 and 1972 Beetle/Super Beetle are the ONLY stock VW seats which are a "Bolt in" interchange. --- The major difference between a thing that might go wrong and a thing that cannot possibly go wrong is that when a thing that cannot possibly go wrong goes wrong it usually turns out to be impossible to get at and repair. What about seat tracks? Is it the same 2 year beetle deal on them too? Thing/181 seat tracks are Thing/181 only due to the different shape of the floor. can some one tell me was beetle economy and thing steering same? Not really a seat interchange question. When you say "Steering" do you refer to a single part or to the entire steering system?? which one shall i buy for my 71 thing? I believe the earlier wheel would be correct. I have a question. The drivers seat back on my 73 thing is wasted,rusted beyond and is junk,both frame and backrest springs. The seat bottom is in good shape. What seat low seat back from a beetle will bolt to the seat bottom of the thing seat bottom and allow you to use thing seat covers?? 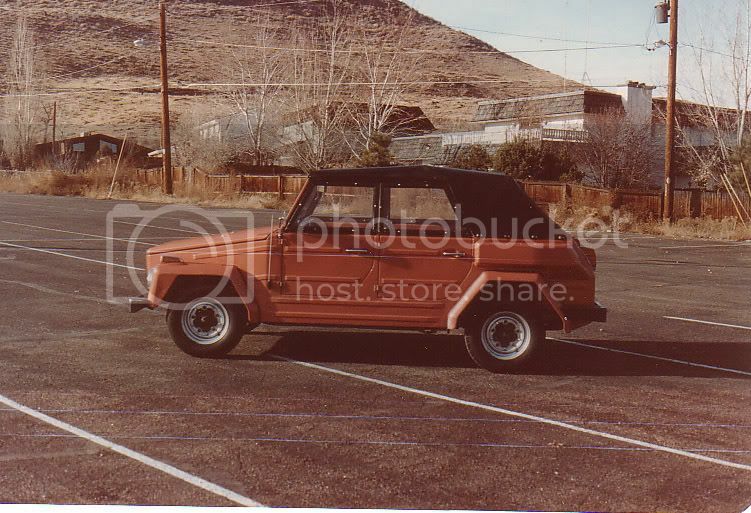 I have noticed that the thread talks about years of interchangeability of the bug/trekker seats what it doesn't talk about is how to correctly ID the 71 Bug / 72 SB seats to help source these say from a lot of 50 seats a seller has in its backyard. I need this identification information in order to buy the correct seats to put on my 181. There is no point in ending up buying a pair of seats that are sold as 71 by the seller and not fitting in the end. 1965 1200cc SP Type114 American Spec. German Sedan Deluxe a.k.a. "Patina"
1969 1600cc SP Type224 European Spec. Bay Window Walkthrough Deluxe a.k.a. "Missionare"
1979 1600cc DP Type182 European Spec. Mexican Safari a.k.a. "Elk"
1976 ------ --- Westfalia Essen Trailer (May 10, 1976) a.k.a. "W.E.T"
do you have thing seats to refer to? if you look at the bottom, the lever, the fingers and the track profile will look identical. Later year beetle seats have a funky three point mount, while earlier have a different track profile. If I have had the 181 seats why would I be looking to identify a pair of 71 bug seats? I have searched the Late Bug forum but with not much luck, all they say is they had a round knob at the seat back and thats it. well, most people want the beetle seats because they are highbacks, as opposed to thing seat lowbacks. many consider it an upgrade. I sold my thign lowbacks to affrod beetle highbacks. Jeesh, just tryign to help. Basically, beetle lowbacks are too old, wont work. the 68-69 seats, IIRC , have wide headrests, while the later ones have narrower headrests..look at the thread i linked, it shows an older one. 73 and up seats will have a three point mount, as opposed to the rails. 68-70 rails have a different profile, more like an "L" than a "T"..
i think the 1970 standard beetle has the same shape as the 71-72, but itll have the L profile tracks . At least this should narrow down the field. I bought a 1973 Thing last year with no rear seats and some not so great looking front seats. My Thing does not appear to have any seat tracks currently welded to pan. It looks like the front seats are bolted to giant block of wood which I'm guessing is bolted to the floor. I am looking for replacement/upgrades that will not break the bank. I found a complete set of leather seats from a 2000 VW GTI for sale near me and would like to know if they will fit. And how much work it will take to get them all mounted safely.